What is a Poet Laureate ? 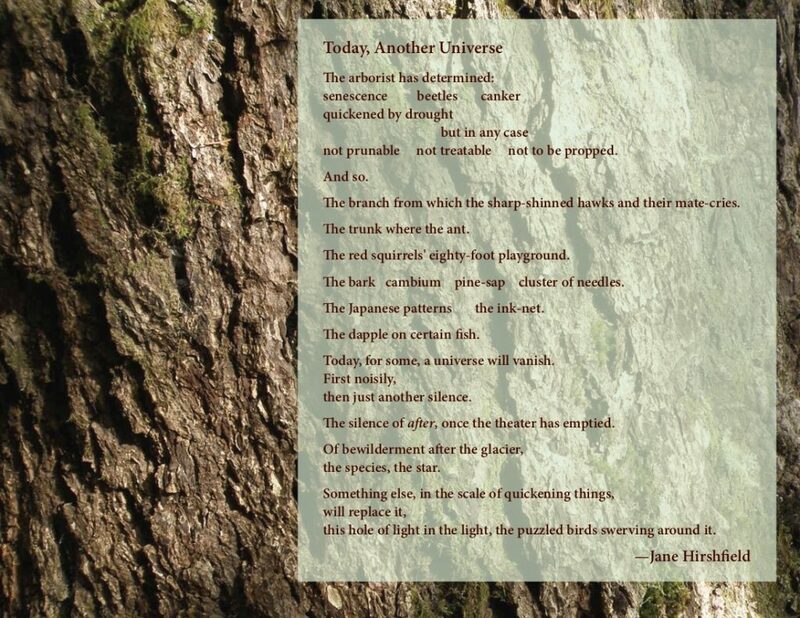 Many thanks to acclaimed poet Jane Hirshfield for allowing this poem to be reproduced in honour of National Poetry Month. Some poems strike a resounding note with the reader, as this one did for me. “Today, for some, a universe will vanish.” That is exactly it, and is why we are working so hard to protect the trees we can in Tofino. This is a most wonderful, illuminating poem, and goes straight to my heart. Thanks, Joanna, and thank you to Ms Hirshfield for allowing you to share it. It is a beautiful poem, isn’t it? Thanks for your comment, Sherry. I know! It seems to be so difficult for us to consider these universes. Exactly what ails us! But yes, lovely lovely poem. Thanks for sharing, dear Sherry. Joanna Streetly has been named as Tofino Poet Laureate 2018. The announcement was made on April 30th during a Committee of the Whole meeting.